This is the home of my new company, Searchlight Battalion Publishing. It was created to distribute and market my new book. 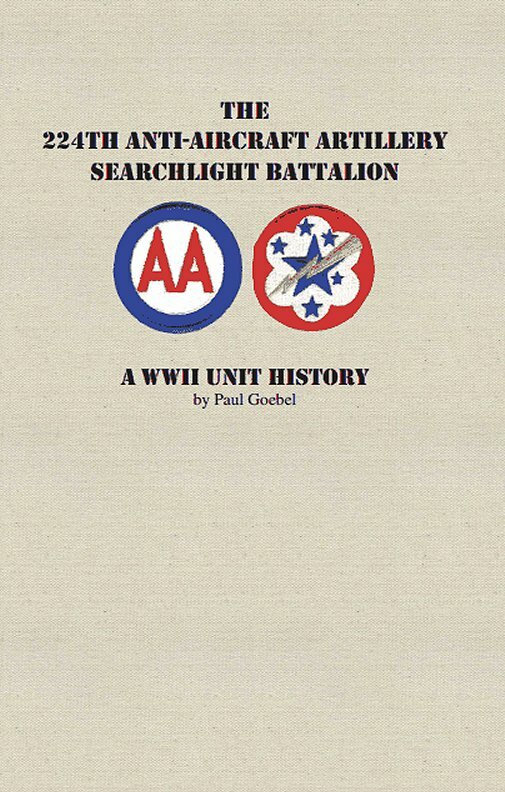 The 224th Anti-Aircraft Artillery Searchlight Battalion; A WWII Unit History. The book came about as the end result of my interest in and research on my Dad’s Army unit. The book tells the unit’s story in words written by anonymous sources found in the National Archives and in a newsletter created for a battalion reunion. Inside you will find images from Army records and my Dad’s photo album. The style is based on similar unit histories I have read. The heart of the story is really the rosters. These are the names of the men that served in the 224th in the Southwest Pacific, first on New Guinea and then the Philippines. My intent when writing the book was to get the battalion’s story entered into the Pantheon of all the other men and units that served during WWII. This page will grow and expand over the next few days and weeks. Look for images from inside the books and also unpublished photos from the album.